Writing about certain topics can sometimes be a tad dicey, especially if it’s a subject you don’t know very much about. In most cases there’s a good chance that your lack of knowledge will lead you to make a blatantly ill-educated or poorly researched point, which will result in plenty of ire from the specialists of such subject. It’s for that reason that I’m going to be completely honest before I start this write up on EA Sports’ Supercross 2000 and come right out with the brutal truth, which is that I have absolutely no clue about Supercross. Indeed, it is to my eternal embarrassment that I thought Supercross and Motocross were actually the same thing, so it was with great surprise that I booted up Supercross 2000 to find out that they are completely different. Aside from both involving bikes, the two motorsports don’t really have that much in common as Motocross is designed around racing off-road motorcycles on natural terrain out in the wild, whilst Supercross is all about racing on artificial man-made tracks in front of roaring stadiums. I couldn’t tell you which of the two sports is better or more enjoyable, mainly because I have never sat down to watch either of them. Outside of Road Rash, I haven’t even played that many motorbike-based video games, and I somewhat doubt that Road Rash is an accurate representation of the sport. However, I’d had Supercross 2000 in my collection for quite a while, and I felt like mixing things up a bit, so I decided to pop it into my PlayStation to see what I thought about it. Part of me wishes I hadn’t bothered. 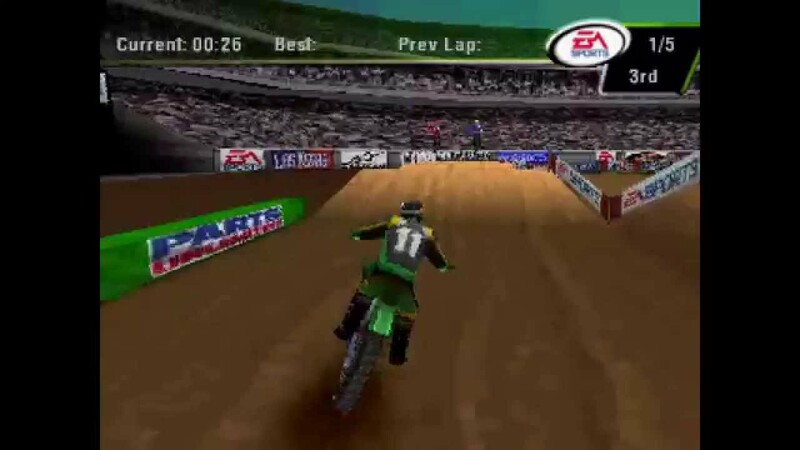 Supercross 2000 saw a release not just to the PlayStation but also the N64 in late ’99 or early 2000, depending on if you were in America or Europe, respectively. 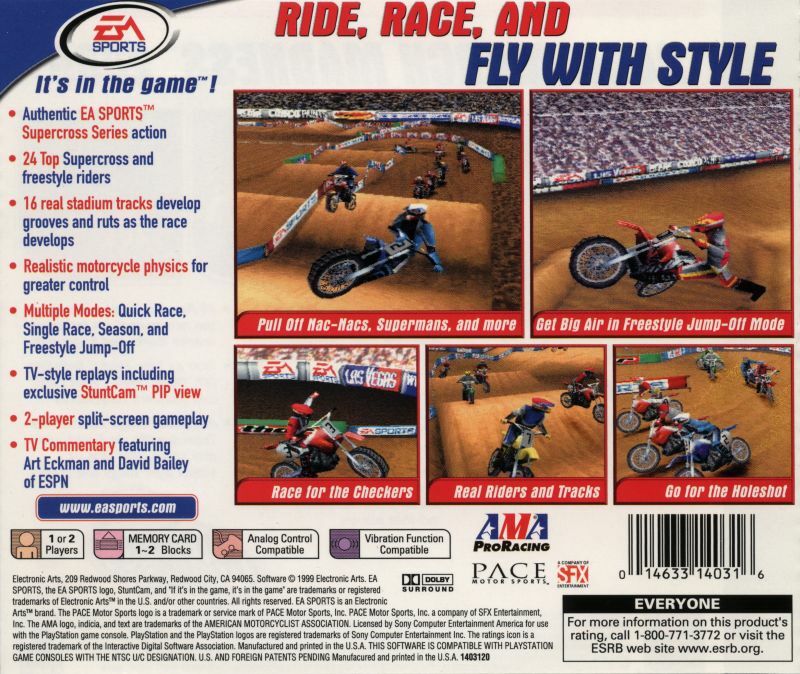 Wikipedia alerts me that there was a game released around the same time by Acclaim called Jeremy McGrath Supercross 2000, but that isn’t to be confused with EA’s Supercross 2000. Why they felt the need to have such similar names is a question for the respective marketing departments. 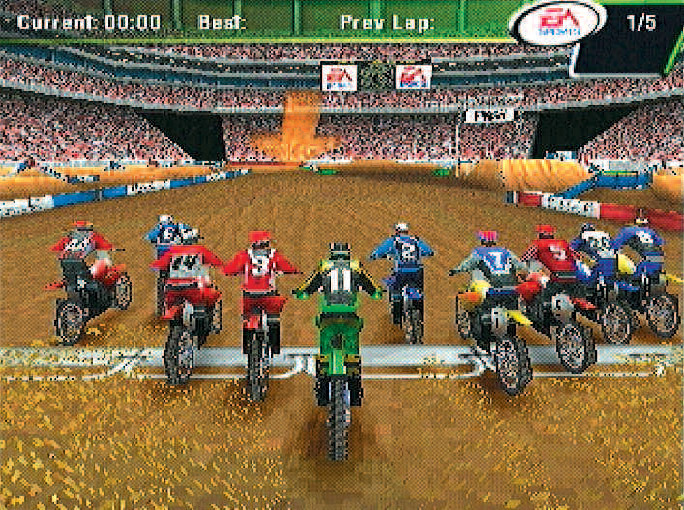 Being that the game comes under the auspices of EA, it includes full licensing of all the official stadiums used in Supercross, as well as 25 of the real racers. Sadly, I can’t confirm to any ardent Supercross fans whether or not the computerised bike enthusiasts race like their real life counterparts as I couldn’t recognise a single one of them, but it’s nice to know they are there if you’re a fan of the sport, at least. When you boot up the game, you’re given the option of selecting single races, freestyle stunt competitions or a full season. Freestyle mode is by far the most entertaining mode of the game as you can tackle three separate bowls, all designed with assorted hills and trenches that give you a chance to get your bike high in the air so you can perform some tricks and earn points. 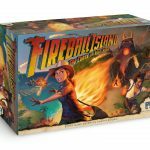 Entertaining though this mode can be, and it definitely can be fun, the small number of tracks means it won’t take long for you to see everything on offer, and there’s a good chance you will quickly tire of it. If racing is more what you are into, then you won’t be disappointed by the length of the season mode as it will give you a chance to battle with nine other racers to see who is top of the podium by the season’s end. Whether you’ll actually want to slog through the season mode is another question altogether though, as the racing in Supercross 2000 directs itself more in favour of frustration than fun. The courses themselves are so compact and narrow that scraping your way around each corner becomes a chore more than a challenge, especially as it’s so hard for your racer not to get stuck on the scenery. This happened to me more than once as my bike would just get stuck on something due to poor collision detection. The controls are sluggish and unresponsive, which just makes the game unpleasant to play, and the game is full of glitches that will see your racer teleport through certain sections of the course on almost a whim. It doesn’t help that Supercross 2000 is a thoroughly terrible looking game, with jagged racers, listless crowds and just a general ugliness to everything. The best the game gets is the wide shot of the stadium before every race, but after that it’s all downhill. It’s one of those games that feels like you’re constantly squinting whilst playing it due to just how bad and messy everything looks. If you happen to be a big fan of the sport, you might be able to overlook the numerous flaws within Supercross 2000 and enjoy it for having the licensed tracks and racers. EA certainly didn’t spare any expense on that front, they just didn’t bother making sure there was an actual decent game to go along with them. However, if you aren’t a fan of the sport and don’t care about racing in real stadiums with real racers, all you will have is the gameplay and graphics to entice you to play, and there is very little enticement to be found in those departments. 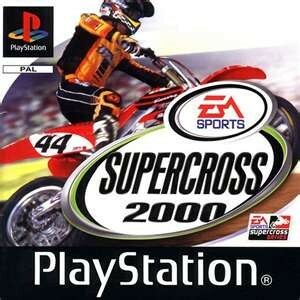 I can’t recommend Supercross 2000, and I really didn’t enjoy playing it. There’s no reason that a game based around Supercross couldn’t be enjoyable to play, but Supercross 2000 is not just a bad Supercross game, it’s a bad game period. It actually feels quite a bit like the early FIFA games on the fifth gen consoles actually, where EA focused on getting all the real player names and making big virtual stadiums but then slapped them over a sub-standard football game, thus making the licenses worthless in the process. 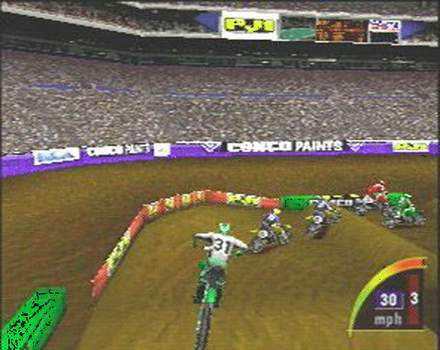 If anything, Supercross 2000 is a monument to the idea that licenses mean nothing if you can’t combine them with an enjoyable gaming experience.